The UTEP Miners face the Old Dominion Monarchs on Saturday at Foreman Field. The opening line for this game has Old Dominion as 2 point favorites and the over/under was set at 57.5. UTEP was led in passing last game by Mack Leftwich, who finished with 231 yards through the air. He went 18 for 36 on the game, good for a 50% completion percentage. Jeremiah Laufasa led the Miners in rushing with 92 yards. He averaged 6 yards per carry on his 15 rushing attempts for the game. Jaquan White was the team leader in receiving with a total of 90 yards and 4 receptions. He finished the game with an average of 23 yards per reception. As a team in that game UTEP had 392 total yards on 70 plays. They gained 9 rushing first downs, 9 passing, and 1 by way of penalty for a total of 19 first downs on the game. The Miners rushed for 161 yards by way of 34 carries. Old Dominion was led in passing last game by David Washington, who finished with 378 yards through the air. He went 29 for 48 on the game, good for a 60% completion percentage. Ray Lawry led the Monarchs in rushing with 103 yards. He averaged 4 yards per carry on his 23 rushing attempts for the game. Jonathan Duhart was the team leader in receiving with a total of 160 yards and 8 receptions. He finished the game with an average of 20 yards per reception. Old Dominion had 548 total yards on 85 plays. They gained 7 rushing first downs, 21 passing, and 2 by way of penalty for a total of 30 first downs on the game. The Monarchs rushed for 170 yards by way of 37 carries. UTEP is averaging 21.3 points per game on the offensive side of the ball. They are completing 18.6 passes per game on 32.4 attempts for a 57.2 percent completion percentage and average 212.6 yards in the passing department per game. The Miners are running for an average of 138.9 yards per game on 36.4 attempts for an average of 3.8 yards per carry. They are also running 68.9 plays per game and average 5.1 yards per play for an average of 351.4 yards per contest. The Miners manage 17.3 first downs per contest and they average a total of 48 penalty yards on 5.3 penalties. UTEP gives up an average of 291.7 passing yards and 36.7 points per game on the defensive side of the ball. They allow 17.1 completions per game on 29.6 attempts for a completion percentage of 57.9. The Miners allow an average of 174.6 rushing yards per game on 33.7 carries for a 5.2 average. UTEP allows 466.2 total yards per game including 7.4 yards per play. They force 1 turnovers per contest and get flagged for 5.7 penalties for 58.2 yards per game. Old Dominion is putting 22 points on the board per game on the offensive side of the ball. They complete 18 passes per game on 33.8 attempts for a 53.3 percent completion percentage and average 203.6 yards in the passing department for each outing. The Monarchs run for an average of 168.8 yards per game on 35.9 attempts for an average of 4.7 yards per carry this season. They also run 69.7 plays per game and average 5.3 yards per play for an average of 372.3 yards in each contest. The Monarchs are gaining 19.4 first downs per contest and they average 34 penalty yards on 4 penalties per game. 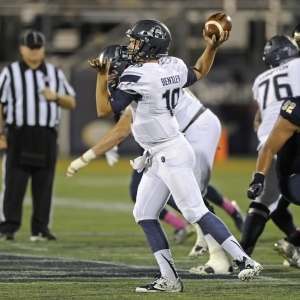 Old Dominion gives up 236.4 passing yards per outing and 35.4 points per game on the defensive side of the ball. They allow an average of 21.3 completions on 32.6 attempts per game for a completion percentage of 65.5. The Monarchs allow an average of 197 rushing yards per game on 43.3 carries for an average of 4.5 yards per carry. Old Dominion allows 433.4 total yards per game for an average of 5.7 yards per play. They force 1.3 turnovers per contest and 4.2 penalties for 45 yards in each contest.